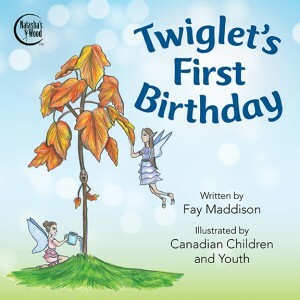 Twiglet will grow up to be a tall, majestic, maple tree. But always remember, Twiglet is more than just a tree, she is magical. As she grows taller, she becomes the meeting place, a safe place, a home away from home for many tiny fairies, baby dragons and other magical creatures that call Natasha’s Wood their home. In the magical land of Natasha’s Wood, Twiglet and her friends will show us all just how powerful friendship, hope and love can be. Even the smallest fairy can offer hope to others! Now that’s powerful magic – made from love! I’ll catch children wishes in leaves as big as dishes. This book art campaign has now closed.